The Arizona Coyotes remain optimistic about the future. GLENDALE – It’s been 48 hours since the Arizona Coyotes’ season ended after falling just short of the Stanley Cup Playoffs. Boasting the league’s second-longest playoff drought, the team was eliminated from playoff contention Thursday night during their penultimate game of the regular season. The Colorado Avalanche grabbed the final playoff spot in the Western Conference finishing four points ahead of the Coyotes. Coyotes general manager John Chayka described the mood as “bittersweet” having fallen just short of the playoffs but was also proud of the team for overcoming adversity all season. The margins in the National Hockey League are razor thin and that’s the source of disappointment for Chayka. The Coyotes battled injuries all season, finishing third in the NHL in man games lost to injury and leading the NHL in points lost in the standings due to injuries, according to ManGamesLost.com. With all the injuries, the Coyotes struggled to score goals finishing tied for third worst averaging 2.55 goals per game despite finishing tied for fifth in goals allowed per game (2.68 goals) and tied for the best penalty kill at 85 percent. Chayka believes an increase in scoring is the next step the Coyotes need to take to get over the hump. Chayka will look at external options but believes there’s potential within the current group for growth who can perform better offensively. Arizona finished the season as the only team in the league to not have a 20-goal scorer as Alex Galchenyuk and Brad Richardson finished with a team-high 19 goals. Center Derek Stepan, who finished the season playing on a torn MCL, is disappointed that they missed the playoffs but was proud of the team’s work ethic. “This group came in and worked hard every single day. That’s something you can hang your hat on. I think it’s a real silver lining,” Stepan said. “The energy this group brought, the work ethic, how we played as a team … each time we won, it was a team win. We were getting production from pretty much every guy. A big reason for the Coyotes staying in the playoff hunt was the play of goalie Darcy Kuemper. 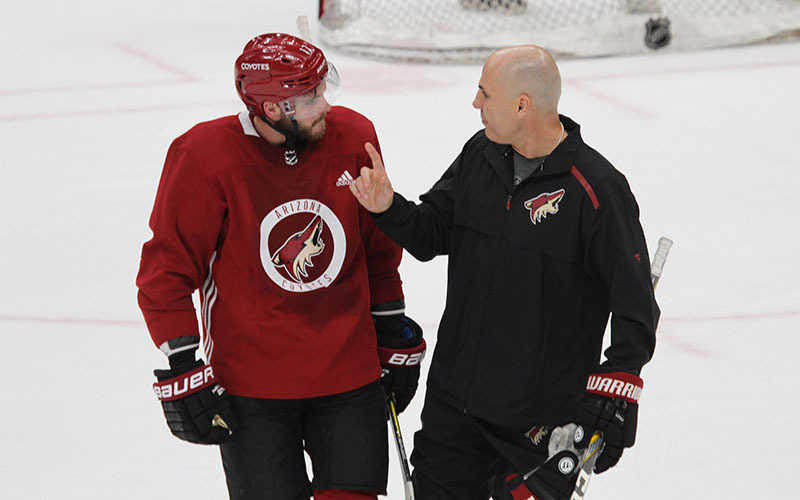 Kuemper was unhappy with his game and sat down with Tocchet and goaltending coach Corey Schwab to discuss ways to improve his game. After that meeting, Kuemper was among the best goalies in the league. Since Jan. 1, Kuemper sported a goals against average of 2.05. After making a career-high 55 starts, including a run of 21 consecutive starts, Kuemper was ready to reflect on his season. Head coach Rick Tocchet said there was a feeling of dejection among the team for missing the playoffs but he believes the team is moving in the right direction.